In Building Bridges, Stuart A. Pizer gives much-needed recognition to the central role of negotiation in the analytic relationship and in the therapeutic process. Building on a Winnicottian perspective that comprehends paradox as the condition for preserving an intrapsychic and relational "potential space," Pizer explores how the straddling of paradox requires an ongoing process of negotiation and demonstrates how such negotiation articulates the creative potential within the potential space of analysis. 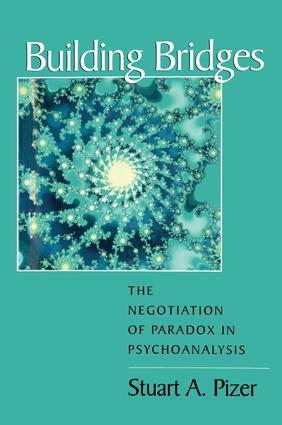 Following careful review of Winnicott's perspective on paradox-via the pairings of privacy and interrelatedness, isolation and interdependence, ruthlessness and concern, and the notion of transitional phenomena-Pizer locates these elemental paradoxes within the negotiations of an analytic process. Together, he observes, analyst and patient negotiate the boundaries, potentials, limits, tonalities, resistances, and meanings that determine the course of their clinical dialogue. Elaborating on the theme of a multiply constituted, "distributed" self, Pizer presents a model for the tolerance of paradox as a developmental achievement related to ways in which caretakers function as "transitional mirrors." He then explores the impact of trauma and dissociation on the child's ability to negotiate paradox and clarifies how negotiation of paradox differs from negotiation of conflict. Pizer also broadens the scope of his study by turning to negotiation theory and practices in the disciplines of law, diplomacy, and dispute resolution. Enlivened by numerous clinical vignettes and a richly detailed chronicle of an analytic case from its earliest negotiations to termination, Building Bridges adds a significant dimension to theoretical understanding and clinical practice. It is altogether a psychoanalytic work of our time. "In this deeply thoughtful, moving book, Pizer lays bare the subjectivity and reflectiveness of the analyst with rare honesty and great breadth of understanding. By elaborating his own unique understanding of paradox and recognition in the context of a generous but critical reflection on the work of his colleagues in relational psychoanalysis, Pizer offers a valuable framework for this emerging perspective. At the same time, his discussion of negotiating the 'crunches' within the analytic relationship illuminates so skillfully the daily experience of our practice - the personal agonies and empathies, the missteps as well as the successes, the love and the hate of this intimate work - that I would commend it to all as a compassionate guide to the analytic journey." "Building Bridges examines contemporary approaches to the understanding of the psychoanalytic process. Pizer fully acknowledges and documents the impossible dilemmas implicit in psychoanalytic treatment. In doing so he provides a theoretical framework for moving far beyond traditional ideas of conflict resolution. Readers will find this book to be a very thoughtful contribution to psychoanalytic technique." Epilogue: "The Scent of a Spring Day"
Stuart A. Pizer, Ph.D., is supervising analyst and faculty member of the Massachusetts Institute for Psychoanalysis and instructor in psychology at Harvard Medical School. He is a contributing editor of Psychoanalytic Dialogues and an editorial reader for The Psychoanalytic Quarterly. A member of the New York Freudian Society, Dr. Pizer is founding chair of the ethics committee of The Psychoanalytic Consortium.